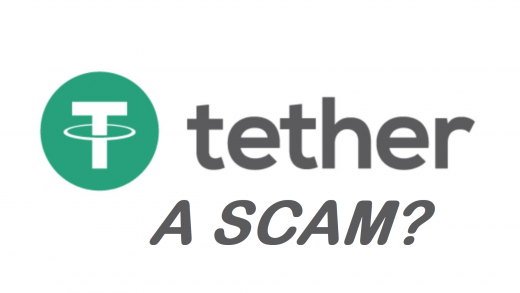 Is tether a scam? Tether has been receiving a lot of negative publicity lately. Tether is actually a cryptocurrency which is digitizing the US dollar. It is present on many of the biggest cryptocurrency exchanges. The main claim against this cryptocurrency is that it is artificially increasing the value of Bitcoin. According to one of the reports, the price of Bitcoin increased significantly after the delivery of Tether to Bitfinex. The founder of Bitfinex is also the creator of tether. According to the report, Tether is actually being used to manipulate the Bitcoin prices. Even though there is no technical or fundamental evidence of the same but the report states that every time, this particular cryptocurrency has delivered to Bitfinex, there is high volatility in Bitcoin prices. According to the report, at least 80% of the total value of Bitcoin is due to this manipulating. However, this is not the 1st report which is alleging that some of the exchanges are actually manipulating in the prices of Bitcoins. According to the Tether developers, it is backed by US dollar. The problem is tether worth the $2.3 billion is in the circulation currently. According to the developers, it is backed by US dollar. This means that there should be somewhere US$ 2.3 billion stored as a backing for this currency. The problem is that many of the people are of the opinion that such a lot of money cannot be held without anyone’s knowledge. This is one of the main reasons why many of the investors believe that this cryptocurrency actually a scam. Only the future would tell whether this cryptocurrency is genuine and can be backed by US dollar or whether this is just a false claim by the developers of this cryptocurrency. For now, however, most of the investors are actually not trusting this cryptocurrency and using the real Fiat currency that is US dollars in order to buy the cryptocurrencies or to withdraw in the form of US dollars whenever they are selling their cryptocurrencies. news.com.au BITCOIN could crash up to 80 per cent if it turns out the price has been artificially pumped up by controversial crytpocurrency tether, analysts have warned. According to Mashable, Bitcoin has been on a run. Despite its recent dip, the cryptocurrency has impressed skeptics and believers alike in its monumental rise in value since its creation nine years ago. But all that could be on the verge of change. Because while the argument rages on as to whether Bitcoin is in fact a currency or a store of value, one question looms large over all: Just what, exactly, is driving its price growth? Well, a consensus answer is slowly forming among critics, and it doesn’t look good for the world of cryptocurrency. In fact, it looks so bad that those same critics are predicting Bitcoin could take as much as an 80 percent hit in value. That would mean BTC, which at the time of this writing is worth around $11,085, would drop down to near $2,200. To understand why Bitcoin could be due for an imminent reckoning, one must first look to so-called stablecoins. The idea behind them is simple enough: peg a cryptocurrency coin, or a token, to something like the U.S. dollar. This would allow for many of the benefits of digital currency without the wild price swings rendering it less than ideal for real-world transactions. One purported stablecoin in particular has dominated the space: Tether. According to Tether, as of Jan. 29 the company has $2,278,090,823.52 and €14,487,093.99 in liabilities. Founded in 2015, Tether is connected to the online exchange Bitfinex. While the founders of that exchange had long insisted Tether was a separate entity, The New York Times reported in November that the Paradise Papers suggested otherwise. Those leaked documents showed that Bitfinex’s Chief Strategy officer, Philip Potter, along with its Chief Executive Officer, JL van der Velde, had worked with the law firm Appleby to established Tether in the British Virgin Islands sometime in 2014. The author of the self-titled Tether Report is not alone in his or her suspicions. Tony Arcieri, an independent cybersecurity expert who formerly worked at Square, released a detailed look at Tether on Jan. 19 which came to similar conclusions and took it a step further. As in, Tether may be creating value out of thin air. And that value, legitimate or not, is being pushed into the cryptocurrency world — allegedly artificially driving up Bitcoin prices in the process. It’s not just random critics and cybersecurity experts making this claim. Nouriel Roubini, an economist and professor at New York University’s Stern School of Business, is right there with them. That Tether may not in fact have the billions in cash reserves to back the billions of Tether tokens issued could be easily disproved by an auditing of the company’s books suggests a simple solution: release an audit. And yet, while long promising such an audit was forthcoming, the latest hope for such an accounting was dashed Saturday when CoinDesk reported that Tether and its supposed auditor were parting ways. Tether did release a document in September which was supposed to prove it held cash reserves equal to its Tethers, but that didn’t convince skeptics. In a conversation with The New York Times, Lewis Cohen — a lawyer who works with virtual currency in his role at the law firm Hogan Lovells — noted that due to its wording the Tether document failed to prove Tethers are backed by dollars. Meanwhile, hundreds of millions more Tethers — known as USDT — continue to be issued. Specifically, over 850 million worth have been “minted” since the beginning of 2018. A recent Reddit post highlighted the confusion surrounding this. Titled “Has anybody here actually had USDT deposited to their bank accounts as tether.to claims is possible on their website,” the thread seeks to find someone that has successfully withdrawn their tokens for cash to their bank account. The silence in response is deafening. Mashable reached out to Tether for comment on these claims, and will update this story when and if we hear back. In the meantime, what does all this mean for Tether, Bitcoin, and cryptocurrency in general? Well, if the critics are correct, likely nothing good. In other words, if this alleged house of cards ever comes crashing down, it may bring down Bitcoin’s price with it with such force that the January crash will look like a walk in the park. And when and if that time comes, Tether’s critics will be there to remind you that you were warned.